Whether your kitchen is large or small, after a few years, it always seems that storage starts to run short. If you can’t expand your kitchen, the next best option is to optimize the room that you currently have available. There are several ways to do this that might not have occurred to you yet. Just by thinking outside the box, you can amplify the amount of kitchen storage you have with some fairly simple solutions. Almost every kitchen has at least one awkward corner cabinet where you can’t realistically store items because you can’t get to them. You can fill it with the stuff you never use, but why keep things you don’t need at all? Instead, reclaim all of that space with a double-shelf corner organizer that pulls out, so you can easily access whatever you have stored on the shelves. These organizers come with wooden shelves and steel rails or are made entirely of heavy metal to last. Pots and pans are incredibly bulky and take up more room than almost anything else. 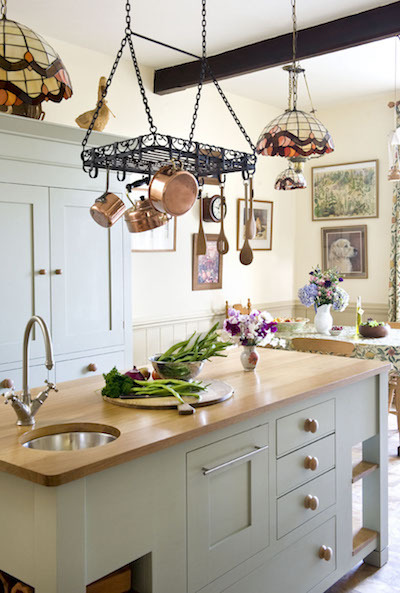 An excellent option to get many of them out of the way is to put a pot hanger over your island or along one wall. Gorgeous options are available in stainless steel, bronze, copper, black matte, and even antique pewter so you can match your décor. With a large overhead hanger, you’ll see most everything you own. You’ll also have immediate access to whatever you need without having to kneel on the floor and search your cabinets for a particular item. 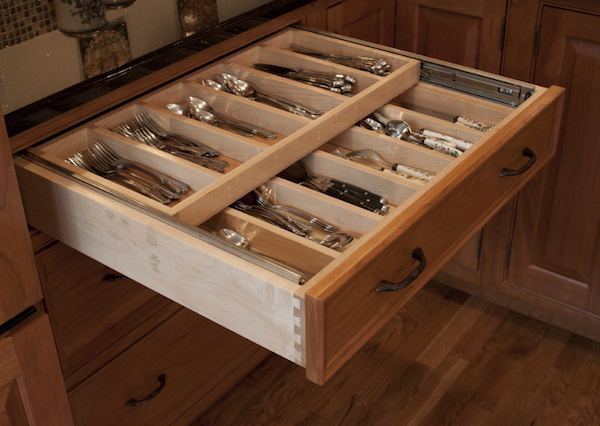 Another area where storage organization often becomes a challenge is the silverware and steak knife drawers. You can double any space that you have with a two-tiered tray set. The top tray is easily removable and also rolls back and forth, so you can access the items in the bottom area effortlessly. These organizers come in multiple widths to fit various-sized drawers. 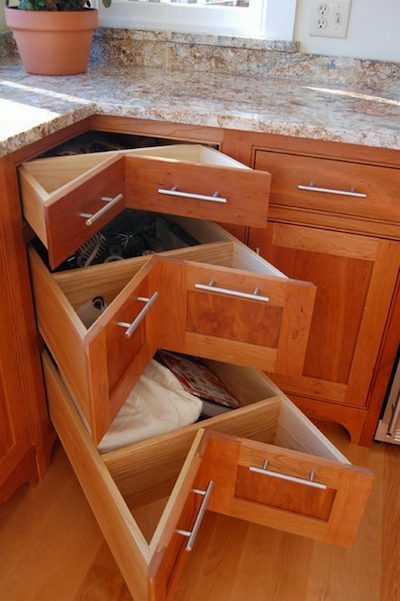 Noticeable lack of drawers in your space? Try these miracle solutions for organizing your storage-challenged kitchen. 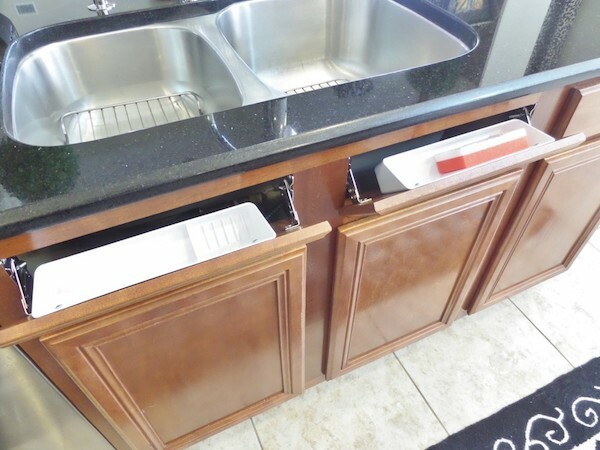 Tip-out sink front trays with hinges are another great addition to any kitchen. These are installed right in front of your sink behind the cabinet. You just pull open the cabinetry which is hinged, and you’ll see a tray attached to the back side of the wood where you can store sponges, soap, scrubbers, and other small items. This kitchen storage option provides convenience and also opens up a bit of extra space under your sink. Pro Tip: Want the ultimate in "hidden" storage? Schedule a MakeSpace pickup today! Optimizing the storage in your kitchen will make meal preparation and cleaning up afterward more pleasant and much less stressful. The secret is not to waste an ounce of space while still keeping items accessible. Make sure your kitchen remains stylish yet functional no matter what. This post was written by Kaitlyn Romero at House Tipster, a full-service website for homeowners, interior designers, and home service professionals. The company offers virtual design tools as well as DIY home improvement tips and a large selection of other resources to help people easily create a gorgeous and functional home.